We had a little over two weeks to kill until our daughter was due to arrive. We didn’t want to risk leaving the area and getting caught by weather, unable to get back to Marsh Harbour to meet her. But that doesn’t mean there was nothing we could do. We were loving Marsh Harbour! 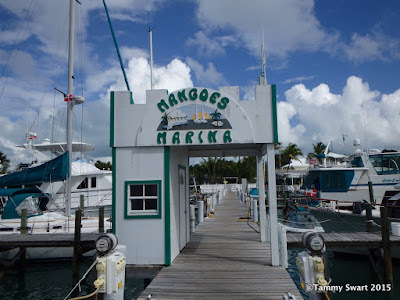 We spent a week in Mangoes Marina. I have to say that Ray and Peter are the heart of this place. They make perhaps a So-So (by American standards) Marina into a welcome oasis in the world. The docks are fixed wood but in good condition and very clean. There is just one long dock with slips on the east and west sides. It is a little tight getting in, but not the worst I’ve experienced and we had no trouble managing with competent help from the dock. The marina is small but has everything we needed. There are two washers and two dryers... kind of pricey at $3.50 each, but at least the dryers work. They aren’t the most expensive we’ve used however, with that honor going to the marina across the harbour. There is a cute little swimming pool with a large deck area. Very clean and cool on a hot afternoon. We loved having the pool to relax in after our day’s work was over. The week passed very quickly. 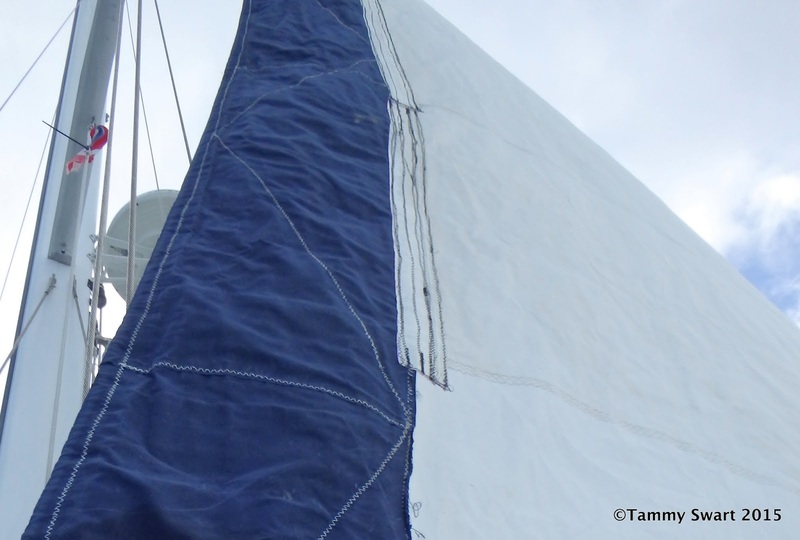 We did some sewing… I repaired our jib which had split a second panel from UV exposure damage. That was fun. We took the Sailrite LZ out onto the foredeck and set up there. It was very hot and still so we rigged our sunshade to cover us so that we didn’t scorch! 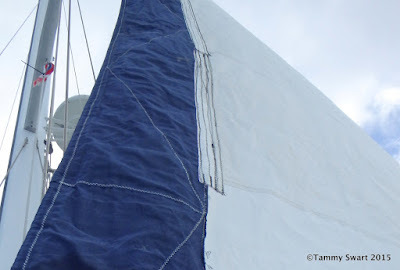 We took the sail down and wrangled it into position and just sewed the patches on. I still had some trouble keeping the thread tension right, but not as bad as the last time. I guess I’m just still learning to use this machine and sewing sailcloth is not easy. We took advantage of the very light winds and put the jib back on the roller furler. Nothin’ to it. The rest of our week was spent doing laundry, provisioning, visiting with other cruisers, catching up on my blogging and getting the boat ready for company. We also explored the town, taking a walk to somewhere every day. We got a lot of exercise while we were in Marsh Harbour. Conch Salad in the making. Tha name ses it all! Not the same, but pretty darned good! We moved the boat out of the marina on our last day there and anchored in the harbor. The marina has very shallow depths on approach so we felt better waiting until high tide before we tried to leave. The high tide wasn’t until mid afternoon which didn’t leave us time enough to get to another anchorage, so we just went out a few hundred feet and dropped the hook. And a major score, we could still get the marina’s wi-fi signal on the boat!!! 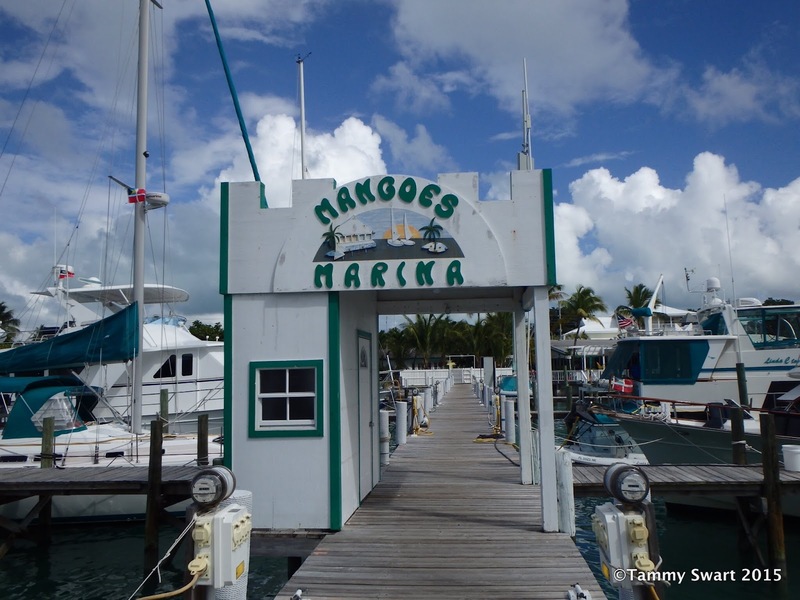 On the morning of our departure for a second stay at Treasure Cay, we decided to make one more run to the hardware store and Maxwell’s to grab a few more groceries. We discovered that the walk to the store was much shorter from the dinghy dock than from the Marina. The dinghy dock is nice and we enjoy feeling that we are welcome and have a proper place to dock. 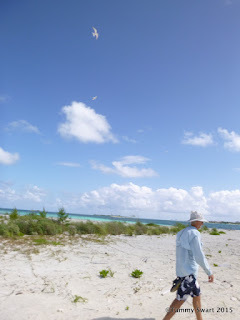 Later that morning we left on a rising tide headed once more for Treasure Cay. The approach there is a bit shallow as well, so getting there near high tide was a comfort. There was a forecast of higher winds in the coming days and we figured that the protected waters and easy life of Treasure Cay fit our purpose nicely. We didn’t want to go to any new places, preferring to wait and share them with Brittney. So we spent another couple of days (more like five nights) just hanging out at Treasure and enjoying the relaxed easy life. We had a pool, a gorgeous beach, restaurants if we wanted them, a grocery store, and a small bakery. If Treasure Cay had a convenient way to get water that was open to cruisers in the anchorage, it would be the perfect place to live. We found our anchor spot from our first stay here to be empty so there was no stress involved in getting settled. We proceeded to spend the next five days relaxing in the pool, walking the most beautiful beach in the Abacos, exploring the little town and just generally kicking back. One day we got energetic and bought some bait. Some fresh fish would be nice and we took off in the dinghy to try our luck on a partially submerged wreck. The winds were too high to make this much fun so we abandoned fishing and buzzed back up into a creek just outside the marina. It was fun back there, lots of turtles and a few other fish. We poked around in the shallows of the near low tide. We love exploring these places where few people go. Suddenly, we were done. Time to go. We didn’t want to spoil new places to take Brittney but the need to move on was upon us. Bakers Bay called our name. We would just pop over there and check out the snorkeling spot. So, we motored the short distance and plunked down our anchor once more. The spot was very pretty with cleaner water than Treasure Cay’s anchorage. We enjoyed the afternoon and evening without leaving the boat. The next morning we were eager to get out and explore. There was a nice poking little island just across Loggerhead Channel. It’s name wasn’t so nice, Spoil Cay… but once we got over there and beached the dinghy, we found it to be very pretty. There were more shells on this beach than we’ve seen in the entire time we’ve been in the Bahamas. Most were very small, but they were everywhere. Too bad I’m not collecting… I could have limited! Beach walks are among our most favorite things to do. Before we knew it, we had circled the entire Cay! We started around the southern end and made our way up the eastern side. There are birds here. Evidently we got too close to somebody’s nest because they became increasingly upset as we explored inland. They began to dip and dive over our heads. Then they began to dive-bomb us! It got a little too real so we hastily made way for the water’s edge which seemed to make them happy. Rounding the northern end of the island we found huge piles of driftwood and trees. We had to walk out into the shallow water to get around them. Being barefooted, this was a little bit disconcerting, but all was well and we eventually left the treelined shore behind and found ourselves back at the dinghy. 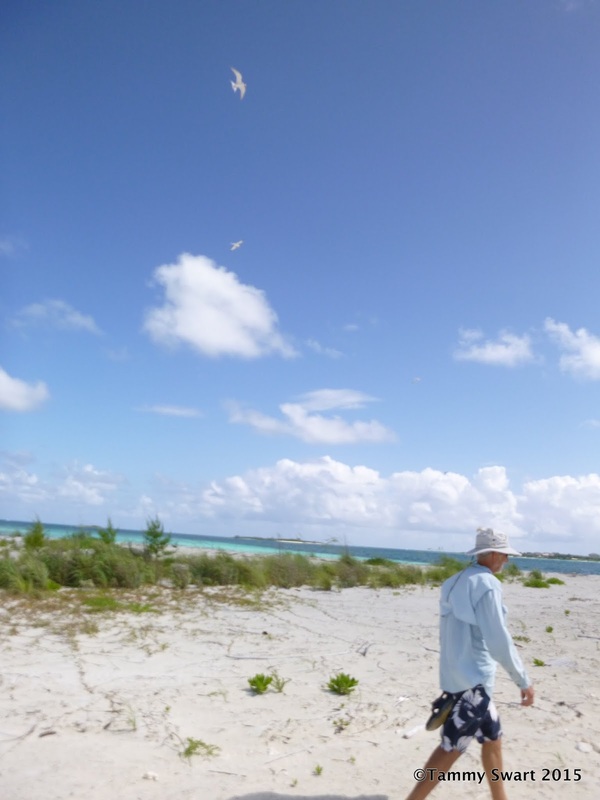 We sped off to visit another, even smaller cay. Gumelemi Cay. I have no idea what that means, or even how to pronounce it, but it was beautiful. There was an inviting looking little crescent beach that became less hospitable as we approached. The surge was rushing violently at that sweet little beach so we motored near, took a look and abandoned the effort. Maybe later. The snorkeling spot was just through the pass and outside the western end of Great Guana Cay. We took one look at the roiling waters of the pass and gave up. It was not meant to be. We made one more attempt to find a suitable snorkeling spot today… a small crescent beach just inside the pass on Great Guana Cay… It looked nice and there were some ledges we could snorkel along… but once we put the dinghy on the beach, we got pounded. It was all Bruce could do to get us off the beach and escape with our lives. So, back around to the more sedate side of the island we went. We beached the dinghy on the beautiful white sand at the edge of our anchorage and jumped in. The water was nice but the snorkeling was uninteresting. Back to the boat we went and eased ourselves into another sunset. We had done it. The waiting was almost over. We had successfully filled the gap and it was time to return to Marsh Harbor to collect our daughter.